Tomorrow is Read Across America Day, celebrated annually on Dr. Suess' birthday, March 2. 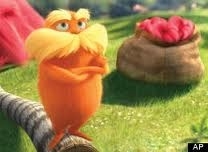 This year the event coincides with the release of the movie, Dr. Suess' The Lorax. (a stroke of marketing genius, no doubt) How will you celebrate with a child you love?